Woodblock printing is a form of relief printing using wooden plates, and is the oldest form of printmaking in the world. The method involves putting ink or paint on the block, laying a sheet of Japanese paper on that block, and then rubbing the paper with a disk covered with bamboo. At times, the process involves multiple blocks, or using different colors on different sections of the same block. Woodblocks mainly consists of two different types: one is carving on a plain-sawn woodblock, and the other on a round-sliced woodcut. Woodblock printing generally means that a plain-sawn block is used. Since around the 7th century, China has been printing Buddhist scriptures and images, as well as paper currencies. The technique came over to Japan together with Buddhism, during the Asuka period (592-710). Only ink was used back then, and they were mostly writings that were printed. Then, after almost a millennium, printing evolved into ukiyo-e during the Edo period (1603-1868), into vibrant paintings using many different colors. Ukiyo-e was completely unique in every aspect – design, technique, and the usage of colors – and this form of Japanese art amazed the entire world. This was also a period when printmakers competed with each other. The painter who drew the underlying sketches, the carver who sculpted the block, and the printer who brought layers of color into the final print – all of these skillful specialists created and improved upon their high levels of various printing techniques. Until when machine printing became common during the Showa period (1926-1989), woodblock printing was the popular method of printing. The autographic qualities are what makes them unique, especially when printing portraits or calligraphy. The reasons why Japanese woodblock prints are highly appreciated around the world even to this day, are perhaps due to the distinct line qualities which can only be achieved by a human hand, the texture of Japanese paper, the slight blur of colors, and their intricate expressions. 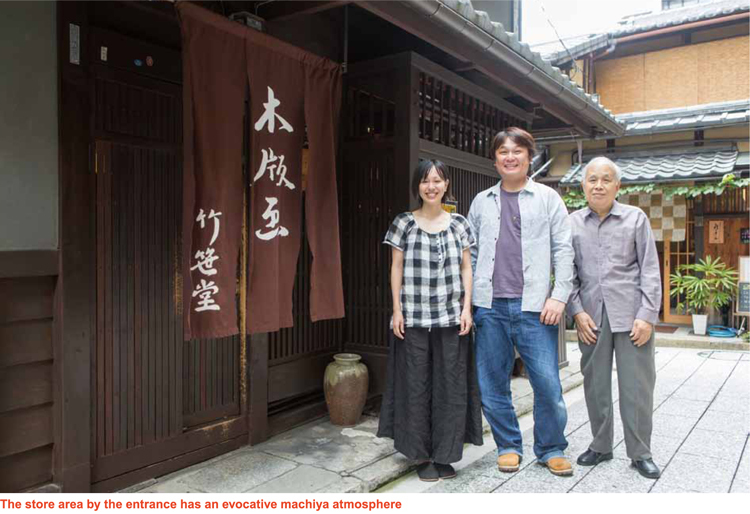 Takenaka Mokuhan is a long-established and masterful woodblock printing business in Kyoto. They have inherited their techniques with a history of 1,200 years in Kyoto, and have evolved into their current company as Takezasado, with Kenji Takenaka the fifth generation master.nSince 1891, Takenaka Mokuhan has been passing on their traditional printing techniques for over 100 years, from master to master. The fifth master, Kenji Takenaka, established Takezasado with the purpose of “inheriting these ancient printing techniques to pass them to the future generations, and not only by preserving those techniques, but also by thinking about how they can evolve.” He creates new works by applying his masterful techniques, and continues to search for new possibilities in contemporary woodblock printing. The original design and colors of Takezasado have been recognized as modern art, and have been widely acclaimed. Takezasado holds printmaking workshops and classes as well and have been covered by many types of media. Not only do they attract fans in Japan, but from across the world. Amezing works are created from techniques and instincts developed over the years. Although highly skilled as a woodblock printing craftsman, Takenaka established Takezasa-do to pursue the possibilities involved in woodblock printing technology. He has also developed a line of original products suited for modern homes. In addition, he has also worked in a wide range of fields as an art director. 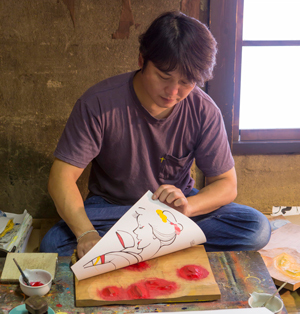 In Takezasado, you will see a development of Japanese visual culture, which are mainly original works by the fifth generation master, Kenji Takenaka, and the sixth generation master, Yuko Harada, as well as collaboration work with a popular illustrator Kunie Kanbara, or art director Yoshiki Uchida. Each product shows different tastes, but all are wonderful art pieces that reflect the heart of Japanese mentality. In addition, creative products are made in Takezasado, using the original beauty of the woodcut with woodblock printing technology. The products made by these craftsmen show high technique and a special warmth. This work is a collaborative piece with Ms. Kunie Kanbara, a popular illustrator living in Kyoto. Ukiyo-e is traditional painting in Japan which developed in the Edo period. 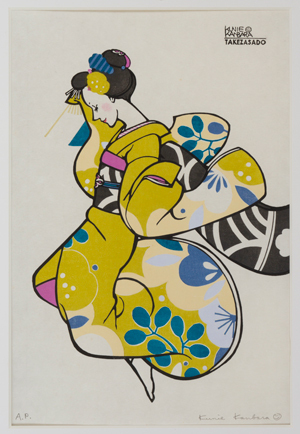 nAll works have been drawn to make woodblock prints as a modern ukiyo-e of beautiful women. 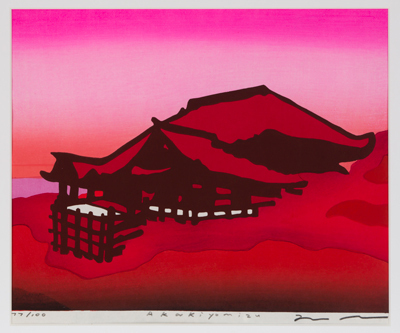 An original work by the 5th generation master, Kenji Takenaka, showing a leading Kyoto sightseeing spot Arashiyama. nTechniques of both Kyo-hanga, with its mild expression like a Japanese painting, and the Edo ukiyo-e, with distinctive color, are combined. The beauty of a mild spring is expressed. A collaborative piece with Yoshiki Uchida, the winner of two international design awards, D&AD (England) and One Show (U.S.). 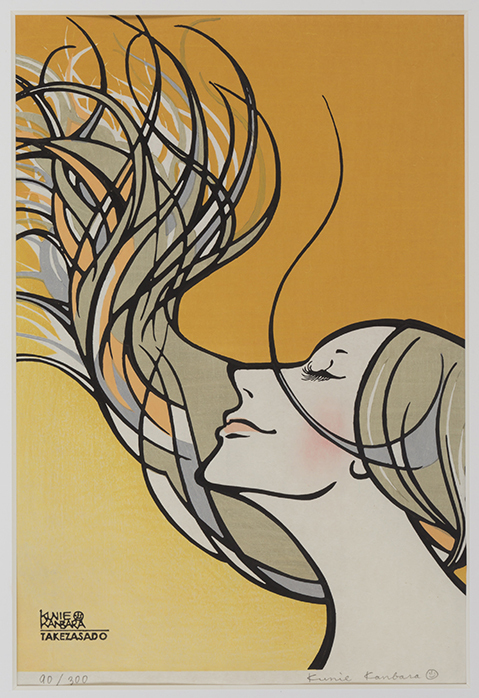 His modern artwork is used to create posters through woodblock printing. An original work by the sixth generation master, Yuko Harada. 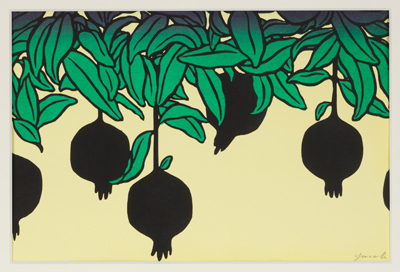 The simple silhouette represents the pomegranate, whereas the green leaves are original with clear outlines. The tropical colors suggest the glossiness of the pomegranate. It is a woodblock print which seems wriggling in rhythmic composition. An original work of the 5th generation master, Kenji Takenaka. He chose Kiyomizu Temple, a widely-known sightseeing spot in Kyoto, as the motif with a fiery sunset and autumnal leaves. It is an impressive work drawn with a gradation of bright red colors. Kyo-sensu are folding fans handmade by expert craftsmen. The framework made of plain wood is scented beforehand, allowing a subtle fragrance when in use. 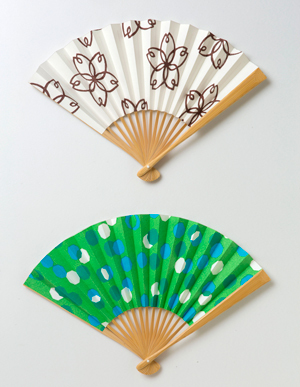 Tosa Washi Japanese paper, which has been made since the Heian era, is used for the surface of the fan. 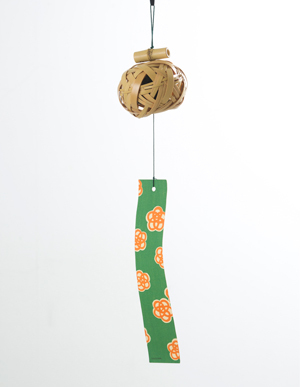 This wind chime was born by collaboration with Yokoyama Bamboo Store, which is an art studio that processes bamboo in Kyoto. All are totally hand-made. Part of the wind chime is made of southern ironware Nanbu-tekki that has an acoustic reputation fine enough to be chosen as one of the 100 finest Japanese sounds . This product is also due to a collaboration with Yokoyama Bamboo Store, and all are handmade. 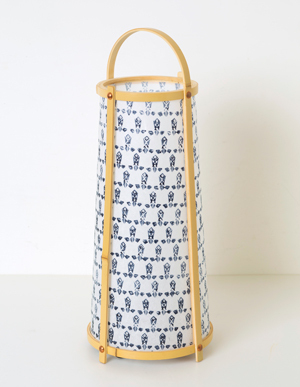 Not just a lantern, it also has a unique example of woodblock design printed on the surface of the bamboo, which makes it very attractive. A sturdy Japanese paper is chosen as the material of the book cover. There is a moderate thickness and it easily fits into your hands. 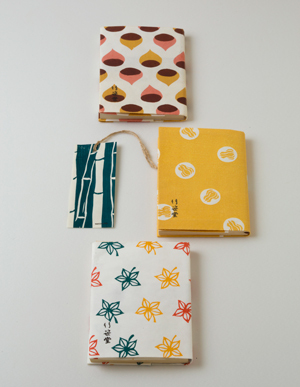 For the bookmark, high quality Echizen paper is used, which is made by a renowned artisan, Ichibe Iwano.It uses 100% hemp in the tassel string in keeping with Takezasado`s aim of using natural materials. 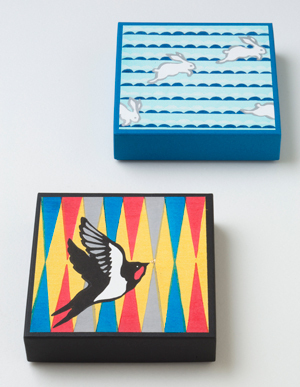 The "Coffret" of Takezasado is a palm-sized small box describing a tale like a picture book. Coffret means “a small box” in French. You can use these to decorate your walls or your shelves. This double-folded original card uses high-quality Japanese Washi paper, as thick as a postcard, with a simple envelope in one set. You can also enjoy it in your room by displaying it on a shelf or a board. Currently Takezasado is run by its fourth, fifth, and sixth generation masters along with five other craftsmen including a horishi (wood engraver). 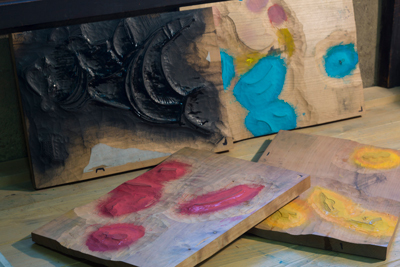 Whereas historically each step in the woodblock printing process was undertaken by an individual specialist, the Takezasado workshop is responsible for every step in-house. The fourth generation master, Seihachi Takenaka, is the father of the fifth generation master, Kenji Takenaka. Although management of this specialty store has been passed down through generations of the Takenaka family, Kenji Takenaka decided to appoint a non-relation, Yuko Harada, as his successor. He claims that his decision was necessary in order to preserve the tradition and technology of woodblock printing. Yuko Harada not only attracts public attention as a female craftsperson in a sphere traditionally dominated by men, but as a talented woodblock artist and product designer in her own right. She creates a variety of works and products through her mastery of the distinct designs of woodblock prints. The Takezasado studio employs the tradional ‘master and apprentice’ mentoring system, and places great importance on communal living and working. The craftsmen, the store manager, and the PR staff all take turns to cook for everyone. The meal that was being dished up when we visited was sōmen, or Japanese wheat flour noodles. It was as if the members of this studio were a traditional Japanese family, all sitting the cooking pot. Clearly, it is through these close personal relationships that traditions are preserved and passed on. The studio will continue to present new concepts and qualities under the guidance of Kenji Takenaka, and attract even more attention as their traditions evolve. Fourth generation master. In 2003 he was awarded the title Contemporary Master Craftsman by the government, and in 2005, he was awarded the Yellow Ribbon Medal from the Emperor of Japan. As a leading craftsman of ukiyo-e printmaking, his works include reprinting an original Kitagawa Utamaro woodblock Kitsunetsuri-no-zu (fox-trapping scene) and Kemari-no-zu (Kemari game scene). Seihachi’s most famous and detailed work is a reprint of the Kujaku Myōōzō (Peacock Myōō or Mayura Vidyaraja), a national treasure housed in Kyoto’s Ninna-ji temple. This work involved some 1,400 layers of printing - a world record number. A former apprentice of both Kenji and Seihachi Takenaka, she was first recognized for her talent nin woodblock printing as a child. While at university, she became apprenticed to Takenaka Mokuhan and developed her skills. After graduation, she joined Takezasado, where she built on her experience as a professional craftswoman, and became involved in numerous productions. She holds numerous workshops, demonstrations, and lectures on woodblock printing with her master Kenji Takenaka, both domestically and abroad. This impressive piece is a collaboration between Kunie Kanbara, a popular illustrator residing in Kyoto, and the 120-year old woodblock printing studio, Takezasado. 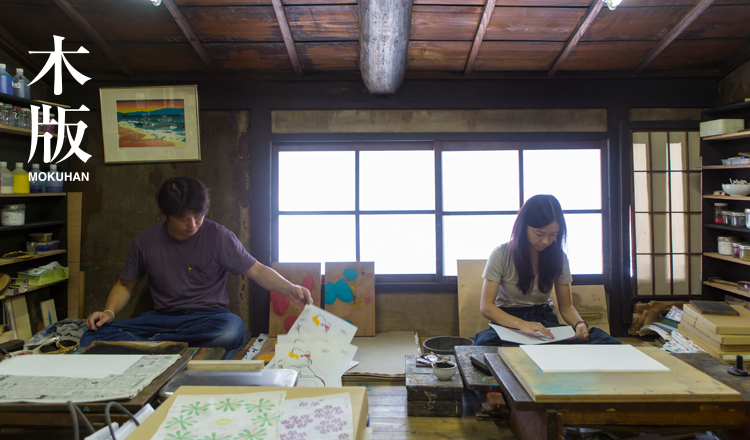 Since 2011, Kanbara and Takezasado have been promoting their internationally acclaimed woodblock printing as an evolving medium, rather than simply a traditional art form of the past. Kunie Kanbara's illustrations are unique for their sharp lines resembling paper cutouts, as well as for their meticulous depictions of people and flowers. For this project, illustrations were drawn specifically to make these woodblock prints, and then printed on paper using ukiyo-e or Kyohanga (Kyoto woodblock printing) techniques. The unique textures and perpectives expressed in these works have fascinated viewers in their exhibitions and demonstrations in museums both domestically and abroad. Continuing in the tradition of Kitagawa Utamaro and Yumeji Takehisa, these may become the next generation of representative Bijinga (portraits of beautiful women). Born and based in Kyoto. A professional illustrator since college, she works in a variety of fields such as fashion, music, and advertising. Kanbara’s work has appeared in a multitude of forms ranging from book and CD covers, magazines, to advertising for department stores, home electronics, cosmetics, fashion and collaborative performances. Kenji Takenaka, the fifth generation master printmaker of Takezasado, established a new art brand called MOKUHAN in the autumn of 2013. His well-established specialty store continues to grow – from Takenaka Mokuhan with a history of over 100 years, to the new and evolving Takezasado, and now to MOKUHAN, a brand with the purpose of introducing the art of Japanese woodblock prints to the world. 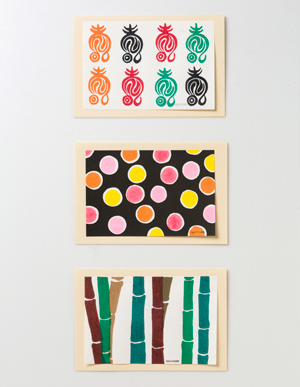 The mission of Takezasado is to promote hand-printed woodblock prints. 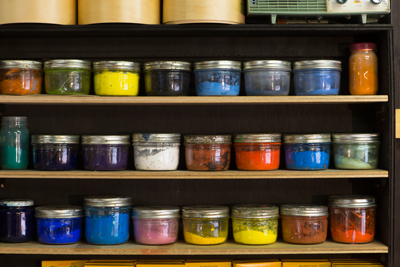 Its role is to develop and expand printmaking techniques through incorporating designs and technologies by other companies and artists. On the other hand, the designs of MOKUHAN products will be transferred onto various products, instead of hand-printed onto paper. In other words, this is a brand established specifically for the purpose of promoting actual woodblock print designs to new audiences. Kenji Takenaka came up with this idea as he walked through the Shikoku Pilgrimage※1 after being recognized with several international awards. Kenji Takenaka has a clear goal: by the 2020 Tokyo Olympics, he wants his MOKUHAN brand to be widely accepted as one of Japan’s foremost pattern designers. He envisions to deliver Japanese design to the world from Kyoto, He is determined to make the next years a culmination of his lifelong career as a woodblock printer and make Kyoto the base from which he delivers Japanese design to the world. 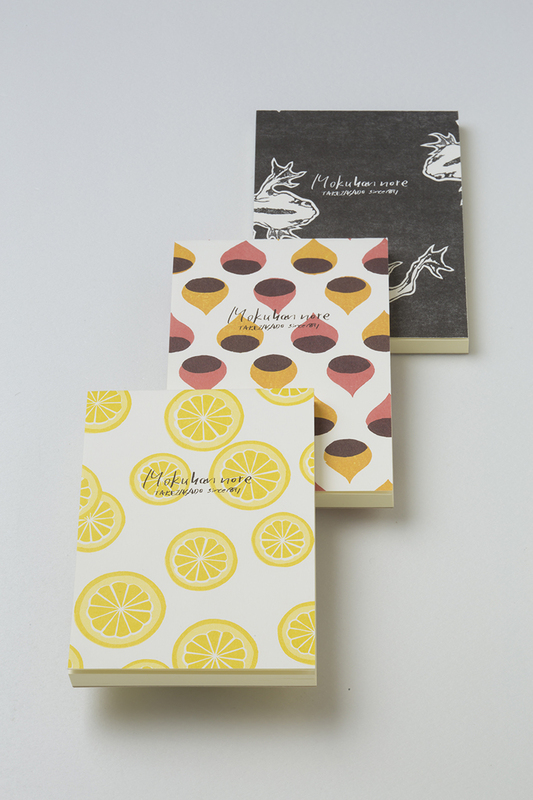 A notepad is now available as the first product, and MOKUHAN is surely a brand to watch. 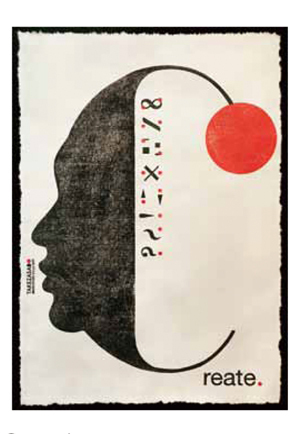 The print above, titled ‘Create.’ was the 2013 winner of the In Book Award of the U.K’s D&AD Awards, a prestigious international design competition. 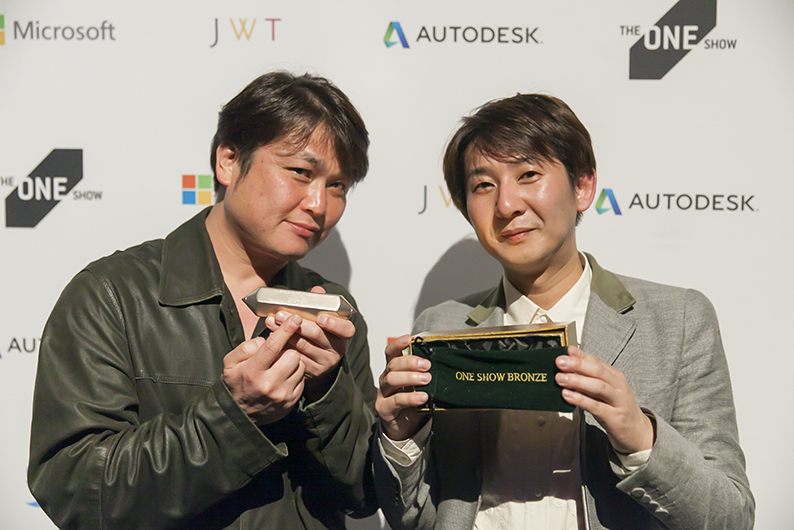 In addition it garnered the 2013 Bronze Pencil Award at one of the three biggest international competitions in the field of advertising, the One Show Design. This was the first time since the Meiji period that an artwork employing traditional Japanese woodblock printing techniques has won an award. The creation of this piece began with a phone call from art director Yoshiki Uchida, to Takezasado’s fifth generation master, Kenji Takenaka. It took great effort for the two to find time to work together amidst their already busy lives, and to overcome the distance between their bases in Tokyo and Kyoto. 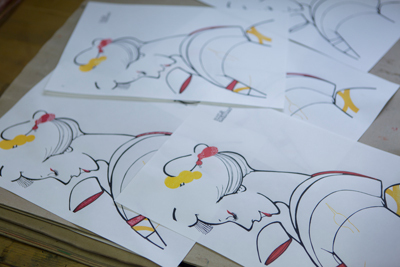 Mr. Uchida took on the essential role of eshi, in charge of the underlying drawings. His unique sense of design is daring, though expressed in a sensitive manner. His original drawings for this collaborative piece are simple and yet innovative, maximizing the characteristics of woodblock printing. Woodblock prints are usually not so large in size, but these two pieces were printed on B1-sized paper, measuring just over a metre high. 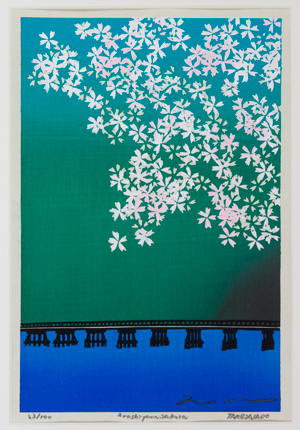 The woodblock design, based on drawings by Uchida, was painted and then printed by Kenji Takenaka and Yuko Harada. This was without doubt a moment when a true collaboration between traditional technique and contemporary art was born. Born in 1974, in Shizuoka prefecture, Yoshiki Uchida founded design studio COSMOS, in 2004. In addition to advertisements, he also displays his talent in areas such as product design, art books publishing, planning and publishing music guides.